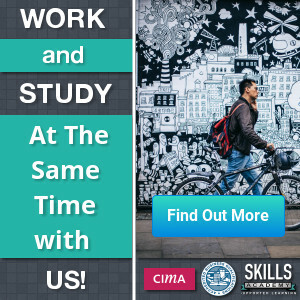 Will you study while you work? Can you go to classes every day and study at a training provider campus? Is your training provider accredited? Does your training provider offer the course you want to study? How will you pay for your course? Are there any bursaries or financial assistance available? Where will you write your exams? If you are currently working, you will want to keep your job while you are studying. That means you will consider home study or distance learning. With home study you will get your study material couriered to your door. Your study material will include all the textbooks and guides and notes that you need to pass the course. You also get to use our online study groups for ICB students. In your online study groups you will meet other students doing the same subjects at you are doing. Your tutor will also spend time online to answer questions and to participate in the discussion. The online study groups will take away the challenge of studying on your own. You will know that many other students are doing the same work as you. And aiming for the same exams. Sharing your problems, your learning, and your successes with other students and lecturers, will make the learning experience easier and more rewarding. In the study groups your lecturer will help answer questions, but also allow students to answer the questions from other students. As you start helping your fellow students, you will see how the best learning and the best test or your own knowledge, is when you try and explain something to another student. Because so many ICB students study while they work, the ICB has increased their exam sessions in 2017 to five sessions in the year. So if you miss an exam session, you know that the next session is no more than three months away. If you are a fast student, you know that you can write an exam as soon as you have mastered the work. No waiting till the end of the year for your exam. Remember that you will have to budget for your exam fees, if you don’t include them in your study fees. So ask about all-inclusive fees when you register with the college. If you are lucky enough to have someone paying for your studies, you might be able to attend one of the many training providers that have campuses around South Africa. One of the biggest face-to-face training providers is Boston College. The are well-established with a good reputation amongst ICB students. Some students can study full-time, but the are not close enough to a campus. Or the campus where they want to study, do not have a space open for them. If you are in this position, you can still make use of home study. You can set time aside every day to study at home. And you can participate in the online classroom with other home study students and your lecturers. Students who choose this version of home study… meaning they are studying full-time, but from home, often study much faster. In a classroom you often move at the pace of the slowest student. So if you already understand the work being discussed in class, then they are wasting your time. When you study at home, you study as fast or as slow as you want. So when the work is easy for you, you go fast-forward. If you struggle with parts of the work, then you can slow down, ask the lecturer and ask fellow students in your study group. You will find that the lecturer is always there to help. And that there are often other students who also struggle with the same bits of the work that you are struggling with. Before choosing a training provider, you must make sure they are properly accredited. Your training provider should be able to show you an accreditation certificate for each ICB programme they offer. They might also have a letter from FASSET regarding their accreditation. FASSET used to be the body with whom the ICB was registered as QAP (Quality Assurance Partner), to enable them to accredit course providers. Recently the QCTO (Quality Council for Trades and Occupations) has taken over the function of registering the ICB as a QAP (Quality Assurance Partner) for the accreditation of course providers. At this stage the QCTO does not issue any documents directly to course providers. But you could also check the accreditation status of your course provider with them. Apart from all these documents and processes, the easiest way to confirm the accreditation of your course provider, is to contact the ICB and check with them. Some course providers only offer a few of the ICB courses. 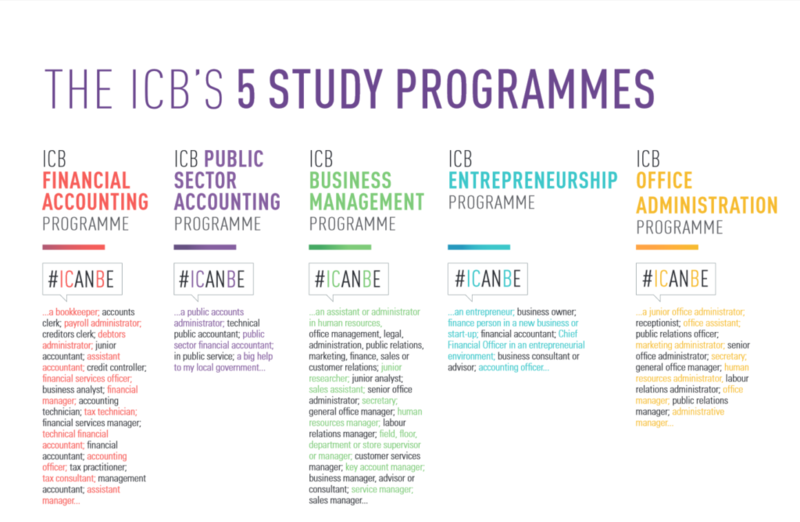 The ICB offers a number of programmes, and you need to check that your course provider actually offers the specific course you want to study. ICB qualifications are divided into four different areas of study. Financial Accounting, Public Sector Accounting, Business Management, Entrepreneurship, and Office Administration. TWP Academy specialises on Accounting and Bookkeeping Studies. They offer other courses as well which can give you a valuable advantage for you next job application or promotion opportunity. These courses all form part of Business Administration. Business Administration is a broad term that covers a lot of different subjects. There are many different colleges and institutions that offer Business Administration courses as well as related courses and subjects. For a more in-depth explanation you can read this ICB Office Administration page. Can you get a discount if you pay the course in full? What exactly do you get for your money? Is everything included? Are you taking a loan to pay for your studies? Does your course provider give you the option to pay the course monthly? Is someone else paying for you? Will your employer pay for your studies? Must you pay a Registration fee, or an Application fee? You can pay your fees in several different ways, including online. The ICB Learner Portal in-depth guide explains how to do this. This is a big financial commitment you are making. So you need to carefully consider all your options. If you are working full-time, then make sure to approach your employer with your study plans. Many employers will help pay for your studies. Or refund a portion of your study fees if you pass. The ICB offers a number of bursaries. You will also find that employers are very happy when their employees start studying ICB courses. So your employer might offer you financial assistance. Make sure to ask! You won’t know until you do your own research. With some providers you can pay monthly. And that might help you. Compared to finding the full course fee and paying that when you register. There are ICB training providers in all our provinces, as well as in Namibia. If you study via distance learning, then you will find distance learning providers offering the courses everywhere in South Africa. You can find out more about the courses that Skills Academy has on offer on their ICB Distance Learning Courses page. There is six classroom providers of ICB courses in Namibia. You can also study with any of the distance learning colleges if you live in Namibia. Remember to check if the prices are different for Namibia. Usually the couriering costs are a bit more… so Namibian students pay extra to cover that. There is one accredited classroom provider of ICB courses in Swaziland. Swazi citizens can also study with any of the South African distance learning colleges. If you require any other information about the ICB, you can find it on this ICB information page. The ICB offers five exam sessions for distance learning students in 2017. You need to make sure that you register in time for your exam. And that you follow the correct process. That means completing the relevant documents and making payments. The ICB has many exam centres across South AFrica. If you are not close enough to an exam centre, then you can ask for private invigilation. However, this is usually an expensive option. Here is a detailed explanation of the exam dates and processes: Skills Academy ICB Exam Registration Process and Dates. You can also read more on ICB here and the ICB Prospectus here.